TERRORISM IS ADVANCING NEW WORLD ORDER - Christian Updates - New World Order. NEWS BRIEF: "Crucial piece of wreckage sought", The Providence Journal Bulletin, Monday, July 29, 1996, p. A-1, A-5. East Moriches, N.Y., "Investigators hoping to prove a theory that TWA Flight 800 was destroyed by a bomb that blew off the cockpit and first-class cabin directed divers to search yesterday for a crucial piece of the airliner's aluminum skin ... Investigators were speculating that the explosion was caused by a bomb in the front cargo section ... But while they focused on that theory, they had neither discounted the possibility of a missile nor ruled out the possibility of mechanical failure ... "
NEWS BRIEF: "Specter of pipe bomb was raised months ago", The Sun Chronicle, Sunday, July 28, 1996, p. 4. Atlanta (AP) "The specter of pipe bombs exploding at the Olympic Games was raised months before Saturday's fatal explosion. In April, federal agents raided the rural Georgia home of two militiamen, confiscating 10 pipe bombs. A report surfaced that the bombs were being stockpiled for potential Olympic targets, but officials quickly discounted that theory. While Saturday's bombing has not been linked to militia groups, the leader of a militia watchdog group said the gathering of nations represents a tempting target for those who see the Olympics as anti-American. 'There's no better place for them to send a message', said Morris Dees, who tracks hate groups for the Montgomery, Ala.-based (sic) Southern Poverty Law Center. 'I think that one of the things they would be trying to do is to disrupt the one-world movement'. " NEWS BRIEF: "Clinton tells Congress to strengthen powers to combat terrorism,", The Providence Journal Bulletin, Monday, July 29, 1996, p. A-4. New Orleans -- "Spurred by the bombing at the Atlanta Olympics, President Clinton called on Congress yesterday to pass expanded measures against terrorism -- including new federal wiretapping authority -- that were dropped from the anti-terrorism bill passed in spring. Mr. Clinton called on the congressional leadership from both parties to join him and the director of the FBI, Louis J. Freeh, at the White House tomorrow to discuss additional steps the government might take to combat terrorism. Speaker Newt Gingrich expressed willingness to consider such willingness to consider such measures, saying [he] believed some agreement could be worked out." These three separate, but related, stories tell a grim tale of potential woe for those of us who oppose the coming New World Order, simply because we understand it for the total dictatorship it is planned to be. For a long time, planners of the New World Order have considered that the American public must be panicked into giving up their Constitutional "rights" so they can be assured of "safety". Of course, government leaders will assure them that this suspension of personal liberty and rights will only be "temporary". I believe it possible that, given all the other signs that the end of the Plan to achieve this New World Order might be at hand, the bombing of TWA Flight #800 and the Olympic bombing might be part of this Plan, with the express purpose of panicking the American public. Already, President Clinton is asking Congress to give the Federal Government greatly increased powers to invade the private lives of its citizens in the guise of protecting public safety. Last week, I heard a caller to a Boston radio talk show propose that the Federal Government allow airlines to run a background check on all persons who wished to buy an airline ticket!! My blood ran cold when I heard this proposal, as I could hear the footsteps of Big Brother! I also could not help but notice that the finger is already being pointed at "right-wing" radical groups such as militias. But, then, I read the statement from this unknown "militia watchdog" group tell us that those opposing the "one-world movement" have targeted the Olympic Games as the primary symbol of the one-world movement. Do not be deceived at this point: our media has been subtly linking "right-wing" gun toting organizations, and "Fundamentalist" Arab terrorists with "Fundamental" Christians for some time now, in the public mind. When the time comes to move against such "dangers" to the public welfare, I believe the net will be cast sufficiently wide to include Fundamental Christians. At this point, let us review some of this Plan of the New World Order regarding terrorism as the final step to achieving the New World Order. (If any of you have not read our expose' on the Six-Step Attitudinal Change Plan, please read NEWS1006 right now, since this 6-Step Plan is being used in these terrorist attacks). Consider the facts of world changes which seem to put us at this final stage. 1. 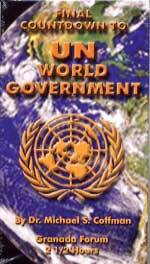 The One World Government is, indeed, coming together quickly, before our very eyes. The One-World Government has taken huge steps to create the planned 10-Nation reorganization of the world, in very obvious fulfillment of prophecies in Daniel and Revelation of the 10 horns and 10 toes. When Western Europe became one nation economically on December 31, 1992, Nation #2 of this plan was created. When the North American Free Trade Zone Agreement is ratified by the respective congresses of America, Canada, and Mexico, Nation #1 was created. Nation #5 is planned to be comprised of "Eastern Europe, including Russia". As we have pointed out in past programs, this peculiar grouping is now possible only since the planned disintegration of the U.S.S.R. Most of the other planned regionalizations in this One-World Government are either already in place or can be created by a simple vote of the United Nation's Security Council. 2. The One-World Economy is daily becoming closer to complete fulfillment. Huge daily transfers of money from the United States to Japan to Europe to the Orient occur electronically. This daily exchange has become effortless. Advancements in computer technology have now made it possible for daily commercial transactions to be accomplished without cash via computer in such a way that meticulously records every transaction as to amount, time, and day. And huge computer systems are now in place in both Europe and America which can record every commercial transaction in the Industrialized world. In fact, these systems are redundant. In other words, either computer system is capable of so recording each transaction. Of course, all this movement to the prophesied One-World systems, as described above, would not have been possible had it not been for the collapse of Biblical Christian values throughout Europe and America. Today, the Christian values which have formed the foundation and the superstructure of Western Society for nearly 2,000 years is almost completely abolished. Individually and nationally, we have abandoned our Christian heritage. John Whitehead, writing in the January, 1993, Rutherford Institute Newsletter, sums the crisis succinctly, as he states, "Our society seems on the verge on total moral and cultural collapse. We seem to have no national 'character' or moral direction. Our public schools no longer teach right and wrong... Bible reading and prayer are outlawed... Christian students and teachers are disciplined for merely talking about their religious faith...'Home school' parents are arrested and put on trial simply because they wish to teach their children the old fashioned [Christian] way... Unrestricted abortion on demand is resulting in the slaughter of millions of unborn children annually...The homosexual lobby is growing much bolder and for the first time in history, we have a president who publicly supports the homosexual agenda...."
It is against this background that we want to share with you some of these plans for a final stage of extreme violence. Christian author, Bill Cooper, writing in his book, "Behold A Pale Horse", talks extensively about this plan for the overthrow of our American System of Government. "Congress has tremendous powers, but fails in most cases to exercise even a token amount... our Legislature has allowed and at times encouraged the Executive Branch to write law... This is done in the form of Presidential Executive Orders, National Security Council memos, National Security Decision directives, and National Security directives... Presidential Executive orders are listed in the Federal Register... which are known to the House and Senate Intelligence Committees... [the other types of Presidential memos and directives] do not have to be reported reviewed, made available to anyone, or even acknowledged that they exist. There is no oversight whatsoever that could maintain a check on the legality of these National Security directives. The President and others within the Executive branch have used these super-secret directives to skirt the balance of power and write law without anyone's knowledge.... These NSD's are powerful, hidden, and dangerous tools... They are being used to destroy our Constitution." Then, in light of this specific authority over residents in the vicinity of nuclear power plants, Epperson notes the extremely interesting coincidence that "the Three Mile Island incident occurred just les than a year after FEMA became operational..." This suspicious coincidence becomes even more suspicious when one realizes that an antinuclear power article appeared in 1978, months before the "accident" occurred, in a radical magazine entitled, "Harrisburg". This article warned about the dangers inherent in nuclear power generation, and then predicted an accident would happen on March 28, 1979, the precise day it actually did happen, and less than one year after FEMA became operational!! At this point, I urge you to watch carefully to see how FEMA is on the news constantly these days. They are even advertising on TV, as backers of a Federal plan to underwrite Home Flood Insurance! FEMA also has specially trained forces from every area of the country, some of which have been deployed to the Olympic Games, before the beginning of the Games.FEMA is being sold to the American people today as a positive Government Agency. Remember, also, that the plan for FEMA is that it would take over only in the event of a serious crisis, either nationally or internationally. Since this is the plan, it is necessary to condition the American people to the possibility, even the probability, of a crisis exploding. Therefore, articles began to appear in the mid-1980's, warning of severe threats posed by nuclear war and by terrorists. We have been monitoring these articles since mid-1991, and have collected dozens. These conditioning articles have appeared in such diverse places as local newspapers, Newsweek and Time Magazines, to specialty magazines such as "Defense and Diplomacy". Further, both TV and radio have also carried this type of story. In late November, 1991, a documentary was carried on the PBS channel warning that America's preparedness against a Soviet nuclear strike was not workable and would fail. This documentary was one hour long; at 55 minutes past the hour, the scenario suddenly shifted to the possibility that Arab terrorists would attack an American city with nuclear weapons concealed within LARGE SUITCASES. This steady drumbeat has continued up to this present time; in the February 30 issue of "World Monitor", an article appeared entitled, "A Cloud That Lingers". The author warned that the collapse of the former Soviet Union has created the very real danger that small nations or individual terrorist groups might be able to steal a nuclear weapon or buy it outright on the European black market. It is, indeed, very disconcerting to realize that a nuclear weapon could be hidden in a SUITCASE. 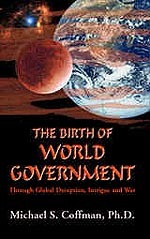 We are simply entering into the final stages of the New World Order. These stages have been amply written about, and have always included staged, planned crises, both international and domestic. This kind of probability always results in someone being called a "far out right-wing fanatic" not worth listening to. However, we know this entire movement into the New World Order is being driven by Satan, and we have further discussed that the hallmark characteristic of the End Times is unparalleled deception of a populace which has already rejected Biblical Truth and Prophecy. Christian author Epperson, in his book, "The Unseen Hand", showed how this type of wealthy backing for revolutionary causes exists in the United States. Epperson quotes radical leader Jerry Rubin, in his counterculture book, "Do It! ", published in 1970 by Ballantine Books. Rubin candidly writes, "Revolution is profitable. So the capitalists sell it... The hip capitalists have some allies within the revolutionary community: longhairs who work as intermediaries between the kids on the street and the millionaire businessmen." Epperson then quotes leaders of the Students For A Democratic Society as saying that their goal was nothing less than the destruction of America and her economic system, to be replaced by a classless world, i.e., the New World Order. Then, Epperson drops the bombshell, "Yet in spite of all this evidence about the nature of the SDS, they continued to receive money from the establishment they were supposedly out to overthrow... an Illinois commission on that state's [campus] rioting said that $192,000 in Federal money and $85,000 in Carnegie Foundation funds were paid to the Students for a Democratic Society... during the fall of 1969". Of course, this was well after the violence perpetrated by these groups from 1966-1968. Then, Epperson showed how additional funding for these type of causes came from the United Nations, the Rockefeller Foundation, the Ford Foundation, United Auto Workers... and from the Cuban Embassy." Another former radical leader, James Kirk, is also quoted in a book by G. Edward Griffin, entitled "The Capitalist Conspiracy", published by Thousand Oaks of the American Media, "Young people... have no idea that they are playing into the hands of the Establishment they claim to hate. The radicals think they're fighting the forces of the superrich, like Rockefeller and Ford, and don't realize that it is precisely such forces which are behind their own revolution, financing it, and using it for their own purposes." Black Panther leader Eldrige Cleaver even realized at the end that the wealthy were buying themselves a revolution. Still another radical leader, James Kunen, wrote a book entitled "The Strawberry Incident", in which he described the industrialists backing the Students for a Democratic Society as being the "left-wing of the ruling class. They offered to finance our demonstrations in Chicago... They want us to make a lot of commotion so they can look more in the center..."
This last statement does, indeed, say it all about the almost unbelievable reality that certain of the wealthy were creating revolution so they could step in, pick up the pieces, and establish their own worldwide dictatorial government, economy, and occult religion. And, remember that some of these old families of power have been into serious witchcraft for many, many years. But, this is the subject of another program. Finally, it is worthy noting that many fiction novels have been written which portray urban terror in the United States as a major portion of their story. The Tom Clancy novel, "The Sum of All Fears" readily comes to mind. In this novel, the Arabs fighting Israel recover a lost Israeli tactical warhead and are able to convert it into an atomic bomb. The Arabs blow up Denver, Colorado, during a Super Bowl football game, killing 100,000 people and nearly starting a nuclear war between the United States and the new Russia. Other novels, TV, and movie plots have also been written with this theme. The only purpose of such novels and movies is to "condition" the people of the United States, and the world, that such a scenario is possible, even probable. Then, when such a scenario does unfold, we will readily believe it, not realizing that we are being spooked into accepting the dictatorial New World Order. To sum up, we cannot be absolutely sure that these bombings are connected to the planned final stages of urban terror designed to finally move the world through the doors to the New World Order, but it is certainly possible. These explosions occurred at the same time as many other segments of the New World Order Plan are moving into their final stages. We must keep our spiritual eyes open and alert, and our prayers constant and powerful before the Lord.